Walter, a very handsome five-year-old tom cat, was found wandering the streets in October with his front leg caught through his collar. He was very timid and frightened and resisted all our efforts to trap him for four months. We even tried using a fox trap to no avail although we did succeed in catching a fox! Eventually we got him into a basket and he was taken to the vet immediately. When the collar was cut away under sedation, it revealed a very deep wound. The experienced fosterer, Dorothy, decided to try to treat the wound, following the vet’s advice to use Manuka honey. 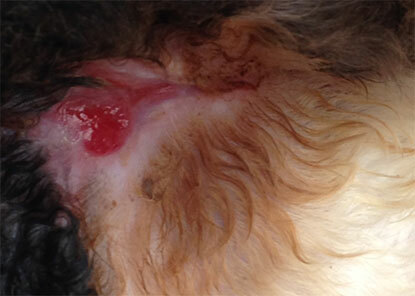 We’re very pleased with the result – after six weeks of treatment the wound has becoming shallower and is healing well. Veterinary grade Manuka honey is quite expensive so the leftover money raised for another appeal will be spent on this. While he was trapped we scanned him for a microchip and contacted his owners, but unfortunately they didn’t want him anymore. When’s he’s recovered from his ordeal we’ll try to find him a new home. 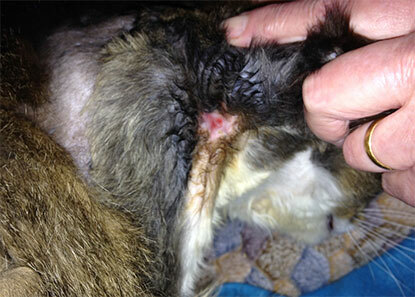 Walter’s plight highlights the danger of collars which are not quick release. If a cat strays and loses weight, the collar can become loose and it is then very easy for the cat to get a front leg through the collar when scratching. Editorial note: If you do choose to put a collar on your cat, use a ‘quick release’ collar to allow your cat to free themselves should the collar get caught on something. Fit it carefully – two fingers should snugly fit between your cat’s neck and the collar. We always recommend microchipping as the safest and simplest means of permanently identifying your cat. If you'd like to support the Colwyn & District Branch in caring for Walter, you can donate here. 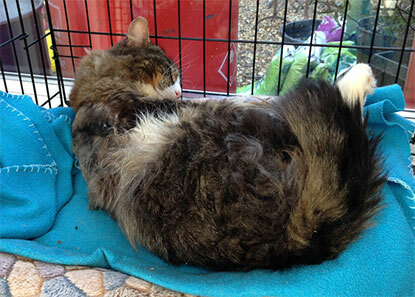 Any funds raised over and above those needed for Walter will be used to help the other cats in the branch's care. Please can we have some photos of Walter when he is feeling better please. Thank you. What a sad story, reminds me of my Alan Cat who was a stray I fed, then one of the neighbours reported him to Cats Protection as a nuisance, so with the help of a nice lady from your organization & a chat with another nice couple of ladies that came round with the cage, I decided to keep him. I have never had a cat before & also have 4 birds, he has messed in the house a few times, is very fussy with his food but has slowly come round, took months to get him in the house! He even has a couple of cat friends, we can even get him in a cat carrier to go to the vets. He doesn't have a collar as he has a wide neck but he is chipped now, I am hoping to get a cat/dog flap for him as he is a large cat! Cats Protection's Easter egg hunt! Meet the cats – LIVE!